The beautiful island of Amorgos is situated at the east of the Cyclades Greece. This island is known for its amazing monastery wedged into a huge precipice at 300m from the sea called the Monastery of Hozoviotissa. The island also has wonderful beaches with fine sand, palm trees and huge cliffs. Anafi is a tiny island very close to Santorini. It distingishes for its barren landscape, its only picturseque village located among rocky cliffs, the isolate beaches and the small chapels scattered along the landscape. Tourism on Anafi is not at all developed but visitors can find the basic amenities for a comfortable stay. The beautiful island of Andros is the northernmost island of the Cyclades Islands. It is an exception: blue and white, windmills and little fishing boats combined with a successive ranges of mountains with steep slopes deep gorges, riverbeds and verdant valleys planted with olive trees, figs, oranges, lemons and vineyards, sandy and pine-shaded beaches. Antiparos is a small island of the Cyclades, close to Paros. 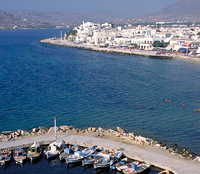 The main city is found on the north-western tip of the island, and is called Antiparos, although it is also known as Kastro. In spite of being small, it has many attractions that assure a good quantity of tourists every year. In fact, the entertainment offered is so varied that it can fulfil the requests of different age ranges, not only during the daytime, but also in terms of nightlife. 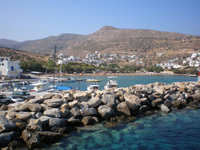 Donoussa is a small island located in the centre of the Cyclades complex, to the east of Naxos. Although Donoussa was inhabited in the ancient times, it was gradually abandoned due to raids of pirates in the Middle Ages. 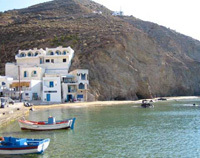 When piracy in the Aegean Sea was confronted, residents from neighbouring Amorgos island settled on Donoussa. Now it is one of the remotest island in Greece where you can enjoy the real traditional style and calm beaches. The beautiful island of Ios is located between Naxos and Santorini, in Greece Cyclades Islands. It is world known for its lively nightlife and attracts for that reason thousands of nightlife addicted. Ios is one of the islands of Greece that has a great variety of bars and night clubs. But, the island of Greece has much more to offer: Its unique village is of great charm and many quiet long sandy beaches with crystal waters can be found even in August. 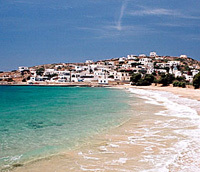 Geographically located between Naxos and Ios, Iraklia is a small island which remains untouched by mass tourism. There, you can enjoy some true relaxing vacations, away from big crowds and noisy spots. Tourism on Iraklia is not developed a lot, except for the basic amenities. Beaches are isolate, villages are traditional and people are welcoming. A beautiful island only one hour from the port of Lavrion, Attica, Kea surprises visitors with its traditional vibe and the beautiful scenery. Although the island gets much busy in summer weekend, the rest of the year is far quiter than other Cycladic islands. Explore the clean beaches, the nice villages and the hidden natural treasures. Ideal for relaxing and some privacy. Tiny and beautiful, the island of Kimolos is only 30 minutes ferry ride from Milos. 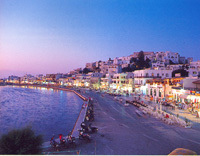 Although it is very close to a popular Greek island, Kimolos has maintained its quiet and traditional character. The most popular areas on Kimolos are located around the port and the capital, however if you do some trekking on the island, you will find more picturesque and remote places. Experience it all at Koufonisia in Greece A part of the cluster of islands called the Small Cyclades, the islands of Koufonisia are nestled between the islands of Naxos and Amorgos. 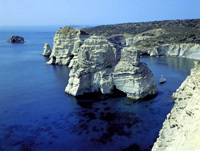 Koufonisia are places of supreme natural beauty that will take your breath away. Take boat rides on lazy afternoons or opt for a day of bar hopping packed with music and delve into the hospitable and delightful charm of the people of Koufonisia. The beautiful island of Milos in Greece is mostly known for its incredible sandy beaches. Its beauty is due to its volcanic landscape which gives to the island particular bright colors and rocks of amazing shapes. This island of the Cyclades offers areas that remind lunar landscapes. The island also has a rich history and some beautiful villages. The beautiful island of Mykonos in the Cyclades must be one of the most famous island of Greece. It is a stony and hilly island. Mykonos attracts thousands of visitors every year. It is world known for its sophisticated nightlife and its beautiful white sandy beaches with crystal waters. The island is compared to Ibiza and has the reputation to be one of the gay capitals of the Mediterranean Sea. The beautiful island of Naxos in Greece is known for its natural and authentic beauty. It is the largest island of the Cyclades and, for that reason, offers much different kind of landscapes. 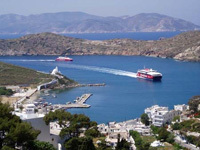 It is an island with rich history and has some of the most beautiful and long sandy beaches of the Cyclades. It is still authentic and its mountainous villages are of unique charm. The capital, its Venetian fortress and the ruins of the temple of Apollon are also of great interest. 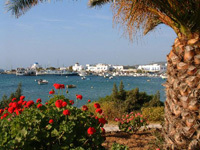 The beautiful island of Paros is located in the west side of Naxos, Greece. It is the third largest of the Cyclades and is considered as one of the most beautiful. It has a little of everything to offer: traditional white painted villages with houses having blue doors and windows, sandy beaches with crystal waters, a lovely hilly countryside with endless vineyards, cycladic churches and monasteries and picturesque fishing harbors. The famous island of Santorini is one of the most frequented islands in the Cyclades and even in Greece. It is world famous for its volcano and its picturesque and spectacular white painted villages with their cubic houses and chapels, perched on the edge of impressive cliffs offering a panoramic view over the volcano. The island also has impressive black sandy beaches. 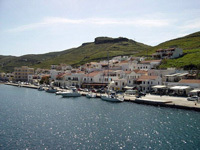 Schinoussa is a tiny island of only 9 sq.km and belongs to the Cyclades complex. 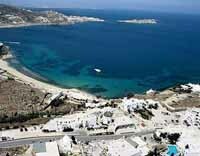 It is located to the south of Naxos and very close to Ios and Amorgos. Schinoussa has only a few inhabitants and paces of life there are low and traditional. The wild landscape, the isolate beaches, the hospitality of the locals and the try Cycladic style amazes its visitors. This is a great island to enjoy pure privacy. 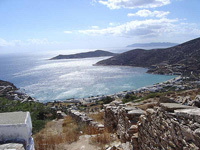 Serifos is in the Aegean Sea, and is part of the western Cyclades. Would you like to walk on an island that hasn't been spoiled by tourism? Nature can be so great that most tourists on Serifos like its atmosphere of peace and freedom deriving from the fact that not many tour packages include this beautiful place in their destination tour lists. The beautiful island of Sifnos in Greece is part of the western Cyclades. It is a quiet island offering nice sandy beaches, charming white painted villages with cubic houses in narrow paved alleys, picturesque harbors, whitewashed chapels and little churches. Plenty of old and nice paths walks link the picturesque villages and make Sifnos the ideal island for walking..
Sikinos is a pure Cycladic island located between Ios and Folegandros. 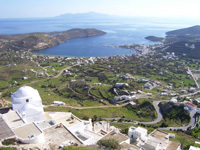 Its capital, Chora, is one of the most traditional Cycladic settlements and the island is surrounded by pristine beaches. Some of them are organized, while others are perfect for complete isolation. The only sight to see on the island is the Byzantine Monastery of Episkopi, which is abandoned today. The island of Syros in Greece is located between Kythnos and Tinos. 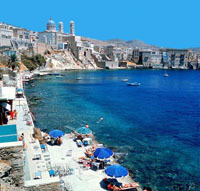 Syros is the capital of the Cyclades and was once an important economical area. What has left from the past glory is the superb town with its neoclassical architecture that has nothing in common with the other islands of the Cyclades. The island has also some quiet family beaches and some really interesting mansions. The beautiful island of Tinos Greece is located between Andros, Syros and Mykonos. The island is known from a religious point of view but it has been misunderstand. The island has much more to offer: 40 traditional Cyclades villages of unique beauty, more than 700 churches and monasteries, thousands of dovecotes and beautiful sandy beach in clear waters..